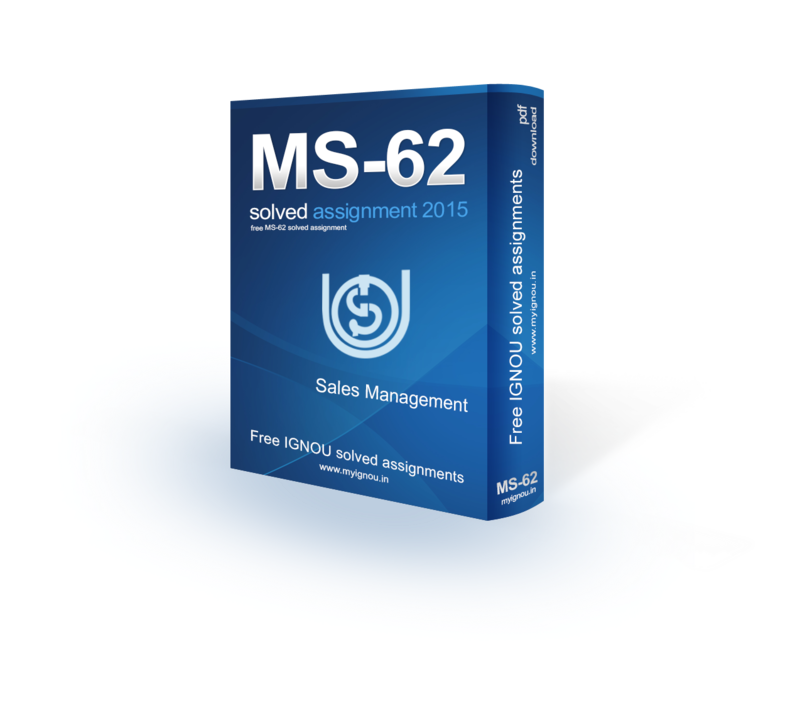 Welcome to IGNOU MS-62 Solved Assignment 2015 download section of myignou.in. Here you will be able to download IGNOU MBA & MP MS-62 (Sales Management) Solved Assignment for (January - June) 2015 session for free exclusively on this website. To get other solved assignments like our facebook page. (b) For a newly introduced consumer durable (ceiling fan brand) in a highly competitive market. Sales management is a business discipline which is focused on the practical application of sales techniques and the management of a firm's sales operations. It is an important business function as net sales through the sale of products and services and resulting profit drive most commercial business. These are also typically the goals and performance indicators of sales management. Sales management refers to the administration of the personal selling component of an organization's marketing program. It includes the planning, implementation, and control of sales programs, as well as recruiting, training, motivating, and evaluating members of the sales force. The fundamental role of the sales manager is to develop and administer a selling program that effectively contributes to the achievement of the goals of the overall organization. The term "sales manager" may be properly applied to several members of an organization, including: marketing executives, managers of field sales forces, district and division managers, and product line sales administrators. This text emphasizes the role of managers that oversee a field sales force. Setting Lux Product objectives - The key component of any strategy statement is to set the long-term objectives of the organization. It is known that strategy is generally a medium for realization of organizational objectives. Objectives stress the state of being there whereas Strategy stresses upon the process of reaching there. Strategy includes both the fixation of objectives as well the medium to be used to realize those objectives. Thus, strategy is a wider term which believes in the manner of deployment of resources so as to achieve the objectives. While fixing the organizational objectives, it is essential that the factors which influence the selection of objectives must be analyzed before the selection of objectives. Once the objectives and the factors influencing strategic decisions have been determined, it is easy to take strategic decisions. Evaluating the Uniliver Environment - The next step is to evaluate the general economic and industrial environment in which the organization operates. This includes a review of the Uniliver competitive position. It is essential to conduct a qualitative and quantitative review of an organizations existing product line. The purpose of such a review is to make sure that the factors important for competitive success in the market can be discovered so that the management can identify their own strengths and weaknesses as well as their competitors’ strengths and weaknesses. Share "IGNOU MBA MS-62 Solved Assignment 2015"
Share this page (IGNOU MBA MS-62 Solved Assignment 2015) to let others know about it!